In 1996, Joanna Rakoff took a job at a prestigious New York City literary agency, lying about her ability to type on an electric typewriter. She found herself on a steep learning curve, needing to master the typewriter, an audio transcription machine, a new vocabulary and a set of unbreakable rules relating to a writer called Jerry. Her scary boss instructs her never to give people Jerry’s contact details, and to try and end phone conversations as quickly as possible. Only after the conversation does she notice the office shelves full of J D Salinger books and realise who “Jerry” is. This is not really another book about Salinger – while the famously reclusive writer becomes an important figure in her life, Joanna doesn’t even expect to meet him or speak to him, and she has never read his books. It is the story of her year, as the title suggests, a year of changes in her life, of work, of her relationship with her boyfriend, of conversations with colleagues, family and friends, and letters from Salinger’s many fans. She is supposed to send a standard response turning down everyone’s requests and invitations, and throw the letters away. What will happen when instead she starts to write back? Somehow, while the details seem potentially quite mundane, the people and events in this short memoir are vividly and convincingly portrayed. I couldn’t see why the author was drawn to her useless boyfriend but I was fascinated by her story of a year in her life, of all her interactions and the choices she eventually has to make. I received a free copy of this book through the Amazon Vine programme. 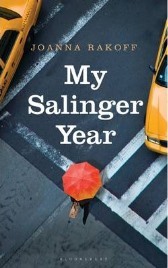 No Comments on "My Salinger Year"